Yin Yoga is where you invite your body to be included in your soul's experience. It is the true feeling of coming home to your body. Life is full of paradoxes, isn't it? The struggle of this is manifested in your body, mind and soul as you try to make sense of the outer world. Your inner world becomes your only solace, yet many times what you find there, if you use your intuition and open your third eye is tightness, resistance, inconsistencies and a feeling of being stuck. You are anything but open and free. You know that yoga is a path to finding wholeness through transformation that only comes when one is still, silent and listening. The body can be the instrument for finding this wholeness. Your body is the metaphor for this struggle, and learning how this embodiment comes into being, will help you to become more whole. The process of "centering" is using the body to understand yourself and your own paradoxes, denials and inconsistencies. It is inviting your body to re-integrate with your mind and your soul. It is your body that is the window to your soul. It is your body that can be the path for deeper understanding. There is nothing that I have found that helps me in this embodied journey to self-discovery than Yin Yoga. It was the yoga practice that I had intuitively found and practiced at home. I just never knew it had a name! Well, as it turns out, this is the way the founders of yoga meant it to be, long, long before the West took over to turn it into a physical fitness practice. In the system of Chinese philosophy, everything is either yin or yang. Yang is left-brained, high energy, driving, productive, logical, detail-oriented, "masculine" energy. Yin is right-brain, feeling, sensing, imaginative, quiet, introspective, reflective, "female" energy. Keeping the concepts of yin and yang in mind, one can easily see that our Western approach to yoga-as-fitness is mostly yang. When the muscles are engaged for athletic prowess, standing and moving with strength, this is the engagement of yang energy. This is not a good nor a bad thing. It is part of creating a total balance in your body, your mind and your life. I love the yang postures of the standing poses like the warrior poses, the downward dog, most of the balance poses and many, many more. The muscles are yang tissue and actively engaged in these yoga poses. The difference, when you engage your bodies for a yin yoga practice, is that you attempt to release the muscles and their activity, rather than contract them. This is what Sarah Powers refers to in the above quote as the "capacity to deeply relax." It is a letting go and releasing to find a deeper surrender, yet a revitalization without a forceful struggle of straining to achieve. Through this openness and awareness, you are more able to go inward to see what is there. In a yang yoga practice, or one that is focused on using the musculature, the goal is to always be moving toward a perfect pose or asana. This is a striving and an achieving way of being. In the yin yoga practice, the exact opposite is true. It is where you allow yourself to be just where your body is, in the moment, without desiring to change it or judge it. This is mindfulness yoga, because yin yoga invites the possibility for you to fully inhabit your body, as it is, in the present moment. This is what makes the yin practice meditative. This is what I love about it! You use the weight of your body to go more deeply into the tissues, the yin parts of your body. Yin tissues are the joints, the bones, the fascia surrounding the muscles, the ligaments and the tendons that are opened. This connective tissue is more resistant to opening and requires time and patience as you astutely observe the subtle changes in your body as your resistances, guarding and "stuckness" slowly let go. Yin yoga primarily consists of postures that are performed on the floor. There are five main principles to the practice that make it unique. 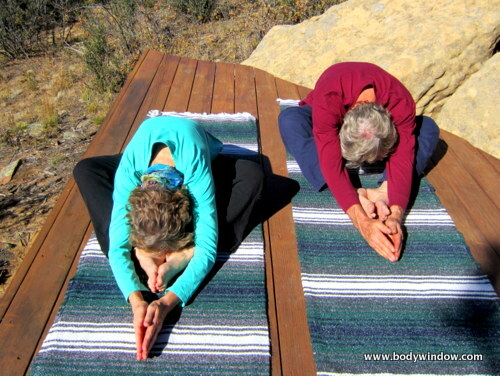 The time required to open the body and it's deeper yin tissues is much longer than in yang poses. Most yin poses are held for at least 3-5 minutes. As you progress in your yin yoga practice at home, you may even stay in a pose for as long as 15 minutes. Just think of that the next time you do the Pigeon Pose! (Sleeping Swan in yin terms). Just be kind to your body, and if you can't hold a pose, initially for a long time, come out of the pose before your injure yourself! Set your intention to make it a few seconds longer the next day! It has long been known in the physical therapy and occupational therapy circles, that long, slow stretches are what changes tissues. Yin postures applies these principles. The goal is for a full muscle release, allowing the underlying tissue to be stretched and open. Concentrate on seeing which additional muscles you can relax and release as you do the yin poses. Where are you gripping? Where is there still tension that can be released for potentially farther opening? The weight of your own body is what provides the gentle pressure on the ligaments, tendons, joints and fascia. With the use of time and your body weight, gradual shifting can happen. I call this "waiting" and "weighting." It is a good mantra as you practice to say, "I wait as I weight." Opening your body to the level of slight discomfort, or "edge" is required for change in your body to occur. Just like in life, if we don't push our boundaries, we stagnate. Yet in order for more opening to occur, you must insure that you continue to keep your breath easy and flowing, or you will achieve the opposite effect. When you hold your breath and push, your body will tense up and your guarding will become stronger. The practice of Yin Yoga invites one to a meditative state using the body. If you do not judge yourself and your body, but quietly observe its process, and stay present and open to this surrender, you open the possibility of fully inhabiting your body and your emotions. It is only through a silent and patient process of meditation that you can become aware of your emotions and of your inconsistencies. In order for this to happen, you must remain still. Keep your intention to stay still, silent, open and aware! Do you see the lovely metaphor of the body as it is sublimely connected to your mind and soul? 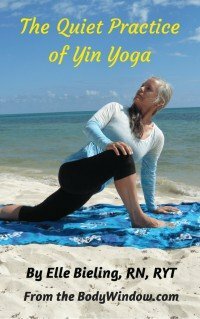 It is only with the principles of yin yoga; time, release of muscles, use of body weight and working to your edge, that you can release your long held guarding of your body and your emotions. It is only the gentle tugging on your joints by your own body weight, that provides the slow opening of the yin tissues. The observation of your body's response over time as it slowly shifts and releases with this tugging, is the essence of yin yoga. It is ever so gently pushing to your edge, to just slight discomfort, just to where you can continue to breathe deeply into the area that is pulled, kindly inviting it to open a bit more. This allows you to become more aware of your internal processes and include them in your understanding of yourself and more fully connects you with your body. When you fully inhabit your body, you invite the ability to fully inhabit your emotions. The practice of yin puts you into this meditative and mindful state. While you cannot prevent your emotions and reactivity from arising, you can temper its expression by becoming aware of it. Consciousness only arises from from doing mindfulness practices. This is a process that requires lots and lots of patience. Yet the pure potentiality of a re-awakening of your body, your mind and your soul becomes limitless! The possibilities of discovery of your inner condition is oh-so-therapeutic! Is Yin Yoga the same as Restorative Yoga? Yin yoga teachers get this question a lot. There are actually some poses in a yin practice that are the same as in a restorative practice. However, the main difference is that restorative yoga is meant to be more supportive and relaxing. 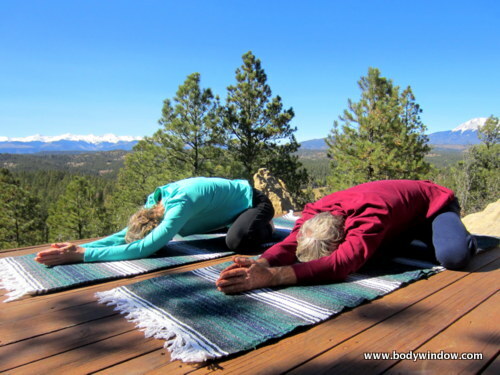 While restorative yoga is meditative, there is less exploration of oneself. Instead the intent is for a totally effortless melting into a pose. The use of props is paramount to achieve this totally supported and relaxed way of being. Because there is no effort involved in restorative yoga, you are never pushing any edges or using your body weight. The goal is for complete and utter relaxation. This is a wonderful practice if your heart needs this. People who especially enjoy this practice are those who are ill, cancer patients, those who are extremely stressed and those who just want a luxurious reprieve from life for awhile! In contrast, the yin yoga practice is intended to bring health to the individual by the opening of the body and the mindfulness of internal processes and emotions. The practice of yin poses is often hated by those of mostly yang energy, because it is really hard to hold still in one position for 5 minutes. Our rushing, driving and achieving world doesn't allow this. Not only are we not prepared to hold still, but our bodies fidget, squirm, ache and hurt when we try to hold still. A mindfulness yoga practice that requires concentrated stillness is very, very difficult for a lot of folks. However, if you remain present to yourself and your body in the yin pose, and resist the urge to fidget and squirm, often major breakthroughs occur. It is through time and inquiry that you gently continue to stay present with your feelings of agitation and discomfort in your body, until it offers the sweet release of heightened understanding. This is not an easy thing to do. Yin yoga is hard. It takes discipline and patience. It is not for the faint-of-heart or the weak-willed! But it IS for you if you want to deepen your practice and find more peace and calm through introspection and release. As in all things in life, your time and effort spent on something, is greatly rewarded. A yin practice will reward you with a greater sense of balance and overall well-being. Through the practice of calming the body, the mind also calms. This then becomes a body meditation, and is very beneficial emotionally and psychologically. We all know the benefits of meditation, and yin yoga is a similar practice. It is also possible that using your body as your window to health and wholeness, that you will have spiritual and emotional breakthroughs with this type of meditative and mindful yoga practice. This is a wonderful experience! Physical breakthroughs occur too, when you wait and weight your body. When deep connective tissue work is done, this lubricates and opens the joints for better joint mobility. Better joint mobility means you will age slower. Better joint mobility prevents injuries and arthritis. Better joint mobility brings a more active and vital energy into your life. For accomplished meditators and yoga practitioners, with increased joint mobility you will be able to sit in meditation longer and with more ease. 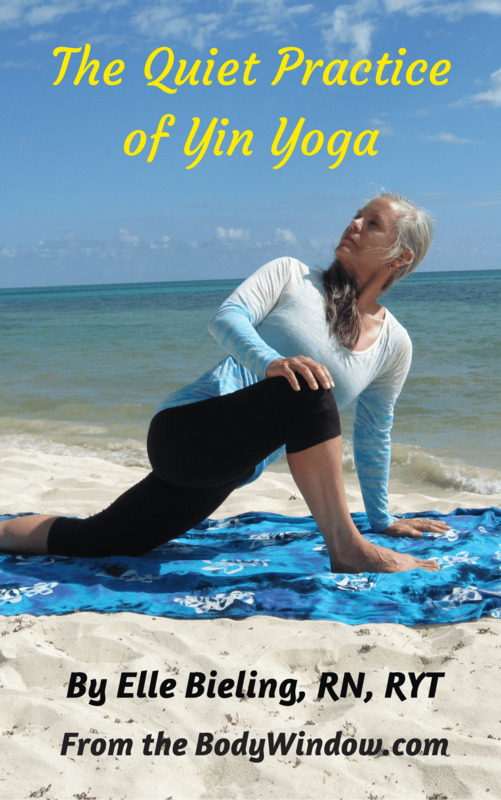 Your yang yoga poses will greatly improve when you balance your yang with the yin. Finally, your overall sense of well being is vastly improved after a yin practice session. Your level of calm, patience and flexibility will spill over from your mat into all areas of your life. In Chinese medicine it is believed that opening the energy channels in your body, like you do in a yin yoga practice, stimulates your body to raise your chi levels. Just like acupuncture, stimulating your energy meridians will provide you greater health, healing and long life! There is no better way to provide your yoga practice with more balance that through a yin practice. When I teach my yoga classes, I now spend one-half of the time on energetic yang poses and sequences, and one-half of the time on introspective, opening yin poses. My students love the practice and love the mix. They love the energizing, strengthening and balancing of the yang poses AND they love the meditative yin poses. It is all about balance. Consider balancing your own yoga practice with yin yoga for more mindfulness, presence and personal insight. May you learn to fully inhabit your body, by being present to it, without judgement or striving. Your whole body, mind and soul will love you for it!